The April issue of ASTD’s T&D Magazine included an article written by Future Workplace in partnership with IESE Business School. 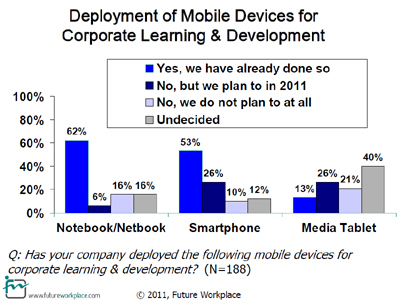 The article, 2011: The Year of the Media Tablet as a Learning Tool, highlighted results from our online research with nearly 200 human resource executives on the increased role of mobile devices for learning, performance support and ongoing employee communications. According to Gartner, worldwide sales of tablets will jump from 19.5 million units in 2010 to 208 million units in 2014. The expanding tablet market is likely to cannibalize the market share of netbooks, media players, and stand-alone eBook readers. 1. By year end of 2011: nearly forty percent of executives plan to incorporate media tablets into learning and development initiatives and three-quarters of these learning executives plan to incorporate smartphones by the end of this year. 2. 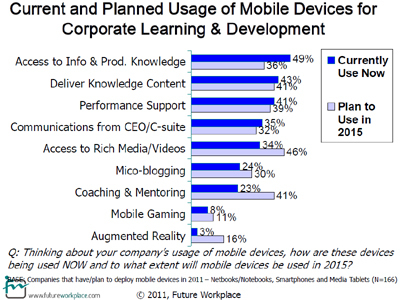 By 2015: Human Resource executives plan to leverage mobile devices not only for learning & performance support but also for coaching and mentoring employees (37%), micro-blogging (27%), augmented reality (14%), and mobile gaming (12%). Cost of developing content across all types of mobile devices and platforms. 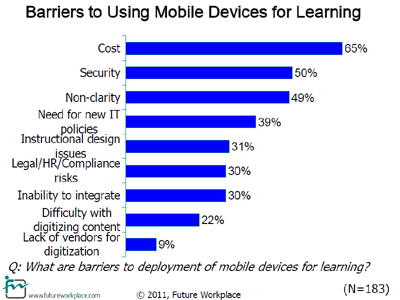 Which barrier is the largest in your organization? How are you dealing with this?